The spaghetti sauce recipe is the same way. Everyone has their own unique way of making it, but all are great!! You’ll notice that my recipes sometimes don’t have very good quantities of ingredients listed. As a rule of thumb, I cover the meat or the top of the sauce with a given ingredient then mix it in and add the next ingredient. I don’t do too well with measuring!! I never really measure so you’ll have to experiment or go with your own individual tastes. I have indicated some of the quantities, but these are guidelines, not exact measurements!! For instance, If you like a lot of garlic, add a lot of garlic, if not add a little or don’t add it at all. Garlic Powder (You can use fresh garlic too-sometimes I use 3-4 cloves crushed and mixed with the ground beef – I still use the Garlic Powder when I do this). Mix all ingredients together with your hands. The meat should be moist but not wet. If the meat is too wet, simply add more breadcrumbs, If it seems too dry, add a little more milk. Form the meatballs. I use about a palm full of meat. 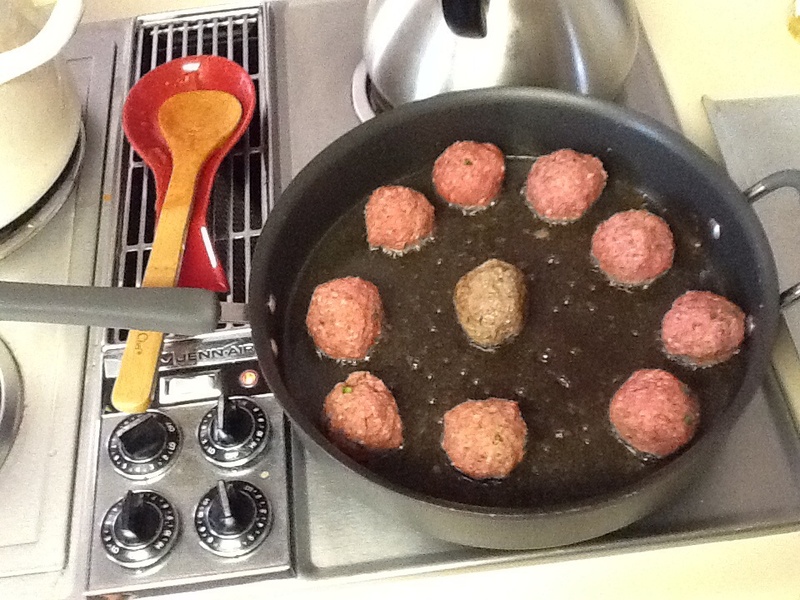 Fry the meatballs in vegetable or canola oil to brown them. Don’t cook them through, they will cook in the sauce. Add the browned meatballs to the Spaghetti Sauce and cook on low heat for at least an hour or up to 3 hours. The longer they cook the better. (Start the sauce on medium heat and lower after it starts to simmer). Stir the sauce often to avoid burning on the bottom! I stir about every 10-15 minutes. In a large sauce pot, add crushed tomato, puree, fresh garlic. I hope you enjoy!! Ciao, Mike. 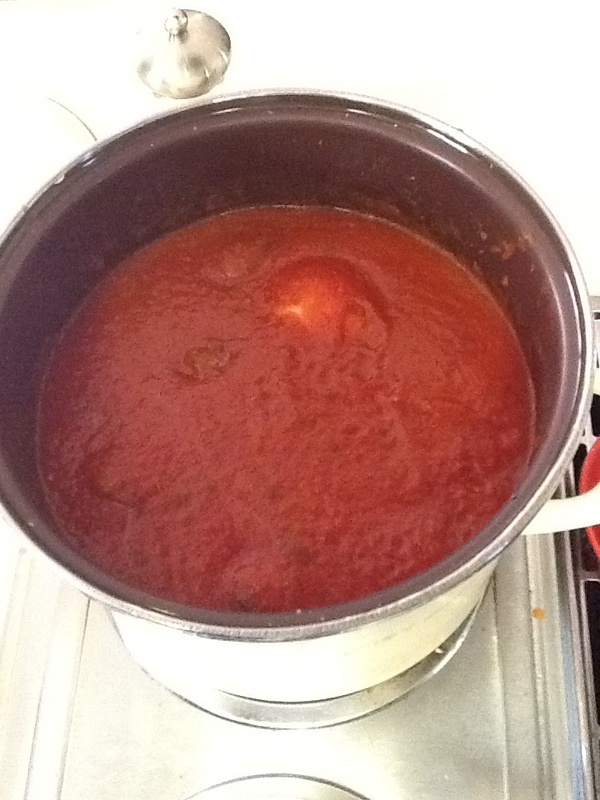 This entry was posted in Recipes and tagged meatballs, Spaghetti sauce, spaghetti sauce recipe. Bookmark the permalink. Mmm yumm – pinned to my board on Pinterest so we can try this when I get home from California next weekend. Thanks for sharing! When ingregients lists an onion is it yellow, white? Also have you ever tried using turkey meat for meatballs? What changes if you do? Any onion will do but I like using vidalia because it adds a little sweetness. If you use turkey the meatballs will be a little more dry so add some milk. Maybe about 1 tbls per pound. Good luck. Let me know how it goes. Pingback: Zucchini Lasagna | Let's Eat!